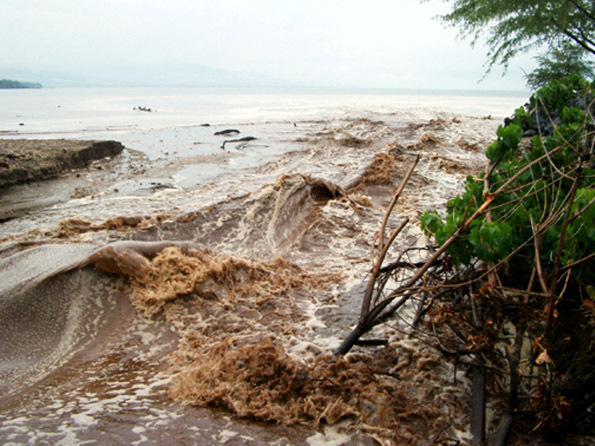 The Kohala Watershed Partnership has received $2.69 million in federal funds through a National Oceanic and Atmospheric Administration coastal restoration grant to improve the condition of the Pelekane Bay watershed on the leeward coast of Kohala Mountain. The grant was announced Tuesday, June 30 by Senate Appropriations Chairman Daniel K. Inouye and Sen. Daniel K. Akaka. The Pelekane Bay Watershed Restoration Project is one of two Hawai‘i habitat restoration projects selected for funding by NOAA through the American Recovery and Reinvestment Act. NOAA received $167 million from the Act to jumpstart the nation’s economy. NOAA announced selection of 50 high quality, high priority projects to support more than 5,000 jobs and restore U.S. coasts on a grand scale. The Nature Conservancy also received funding for its Maunalua Bay Reef Restoration Project on Oahu. The projects were chosen from a pool of 814 proposals. More than a dozen jobs will be created to implement the Pelekane Bay Watershed RestorationProject, which aims to restore the coral reef habitat of Pelekane Bay by reducing land-based sediment inputs into the nearshore environment. By rehabilitating the mauka watershed through erosion control and planting native vegetation, the amount of soil being carried into the bay will be reduced and coral recruitment eventually will be possible, Purell said. “This project will also provide economic assistance to our local community through the creation of jobs. It includes the employment and training of 14 new field personnel, who will gain skills in conservation work that can be applied to future restoration projects. The communities surrounding the watershed will also benefit from improved coastal habitats, fisheries, cultural sites, and tourism,” Purell said. * and constructing 20 miles of goat-proof fencing to create 11,750 acres free of feral goats. The designated area includes pastures, stream corridors, and remnant native dry forest owned by Queen Emma Land Company (6,600 acres) and state Department of Land and Natural Resources (390 acres), all leased to Parker Ranch. These landowners and the lessee are founding partners in the Kohala Watershed Partnership, and have been working together on watershed management projects on Kohala Mountain for many years. The grant specifies that work is to begin Aug. 1 and be completed by December 2010. Detailed job information will be available within the next week at hawp.org/kohala.asp or by contacting Purell at 333-0976, by e-mail at coordinator@kohalawatershed.or…, or in person at The Kohala Center, 65-1291A Kawaihae Road, Kamuela. Project personnel to be hired include field crew, field technicians, and an outreach coordinator. The Kohala Watershed Partnership (KWP) is a voluntary coalition of private landowners and State land managers who joined together in 2003 to work across property boundaries to manage the forested watershed of Kohala Mountain and protect it from threats. Invasive alien plants, feral animals, and fire are the greatest threats to the watershed. Landowners include Parker Ranch, Ponoholo Ranch, Queen Emma Land Co., Kohala Preserve Conservation Trust, state Department of Land and Natural Resources, state Department of Hawaiian Home Lands, Laupahoehoe Nui LLC, Kahua Ranch and Kamehameha Schools. Associate partners include The Nature Conservancy and the ccounty Dept. of Water Supply. The KWP works in partnership with The Kohala Center, a Hawaii Island-based nonprofit dedicated to environmental research and education that support a sustainable future for our island and the world. To learn more about the project and KWP, visit hawp.org/kohala.asp or call Purell at 333-0976. For more information about NOAA Recovery Act projects, see www.noaa.gov/recovery/.